The SAS Group is the Official Airline for Ruby Fools and offers you a special discount. Simply quote event code DK0824 when calling your local SAS office and save up to 20 % on your ticket. 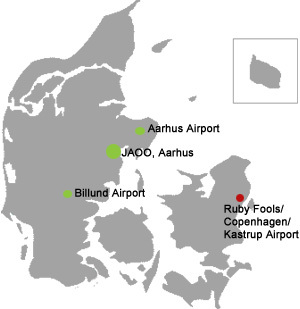 Copenhagen Airport has all international and national connections. InterCity trains, regional trains and city trains all stop at Hovedbanegården (Central Railway Station). This also applies to trains to and from Copenhagen Airport. The taxies of Copenhagen have taxi ranks at Hovedbanegården (Central Railway Station) and ranks in front of Radisson SAS Royal Hotel on Hammerichsgade.